Here at Gunpla 101, we’re just dipping our toes into the world of top coating and weathering, and haven’t even started painting yet. 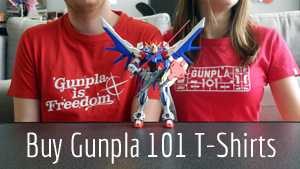 So we decided to ask a veteran Gunpla modeler, Otaku Dan, for his advice. In this guest post, Dan demonstrates how you can make your Gunpla look more realistic by graduating from stickers to painted detailing. I’m going to be frank with you: the majority of the time, stickers look and feel cheap. The glue is weak, so over time it will fall off. Over time, dust will collect around the edges and it will look grimy, unless you heavily apply topcoat to the to the point that it levels out the edges. But this article is not about bashing stickers entirely. Some stickers are useful, and they’re easy for beginners. This is about when you’re ready to move on from them and paint on the details. In the picture below, you can see the shoulder of my Master Grade Kampfer. This is the sticker that came included with the kit. As you can see, the sticker is sort of transparent and you can see the blue through the white, unlike the model on the show. Let’s fix that up with paint. In this picture, you can see that I went ahead and painted the detail. As you can see, the white pops due to the contrast on the dark plastic and looks so much better. So what do I do to add detail such as this? I simply tape up the part, place it on a alligator clip, and paint my troubles away. In the past, I have used the standard blue painter’s tape in the past due to it being inexpensive. However, I’ve had a lot of bad experiences it with such as paint leaking. Now I use is Tamiya 6mm masking tape because the glue is strong enough not to move after it has been applied, yet easy to peel off when I’m done. No matter which tape you choose, when you remove it, use tweezers and do it slowly. If you do it too quickly, it it can damage the paint. One tip that I have: if you want to add panel lines to painted parts, spray gloss topcoat to the painted part first. It will allow the panel line ink to flow better and it will protect the paint when you remove the extra ink. After you’re done, spray your matte topcoat, and it will look amazing. If want an alternative to decal stickers, use water slide decals instead. There are sites like Samuel Decal that you can order these water slides. If you want to make your own, you can purchase decal paper and print your own. And once you get them, there is a great article here on Gunpla 101 about how to apply water slide decals. Feel free to use the stickers that come with your Gunpla as long as you want. But as you become more experienced, I guarantee you will start to see the appeal of paint.